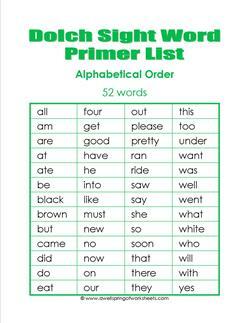 These Dolch sight word lists cover grades pre-primer (preschool) through third grade. They are color coded to match the corresponding Dolch sight word flash cards on this website. The number of words on each list varies by grade (between 41-52 words each). 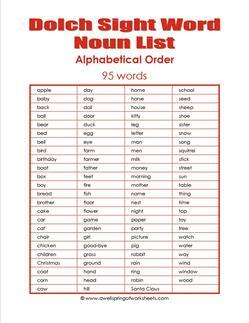 Each list of grade level words do not include nouns. Dolch’s separate list of nouns has 95 words. 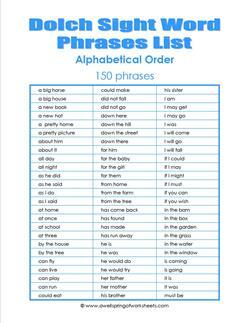 You will also find a list of 150 Dolch sight word phrases. 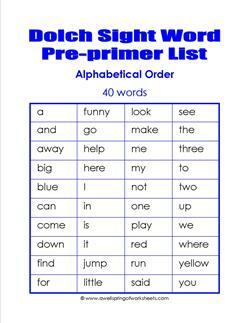 Go to this page to choose from all the Dolch sight word resources in this set. 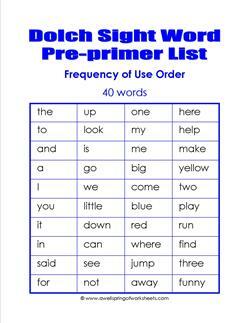 Here is the pre-primer (pre-k) Dolch sight word list of 40 words in a bright blue in alphabetical order. My pre-primer Dolch sight words list comes in a bright cheerful blue in the order these 40 words are used most frequently. 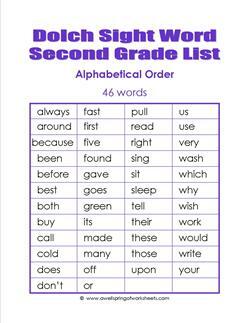 My kindergarten Dolch sight words list of 52 words in a primary green in alphabetical order. 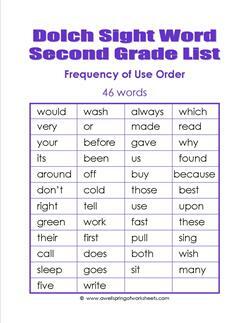 Kindergarten Dolch sight words in a nice tidy green list in the order these 52 words are used most frequently. 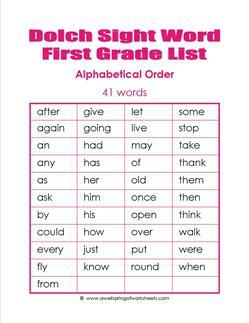 This first grade Dolch sight words list comes in pink with all 41 words in alphabetical order. 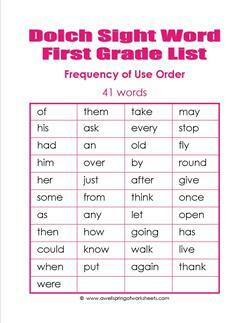 Here is my first grade Dolch sight words list in a pink theme in the order these 41 words are used most frequently. 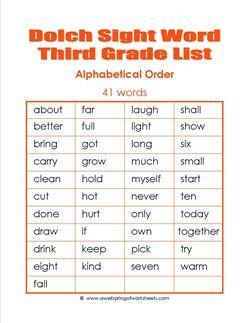 All forty-one third grade Dolch sight words listed in alphabetical order in a nice bright orange. 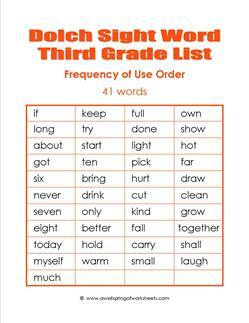 Third grade Dolch sight words listed in a bright orange in the order these 41 words are most frequently used. 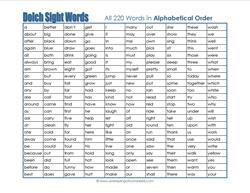 All 220 Dolch sight words are listed in alphabetical order in ten columns of 22 words each. 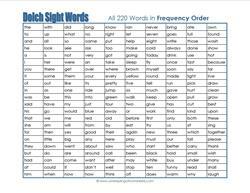 All 220 Dolch sight words are listed in frequency of use order in ten columns of 22 words each. 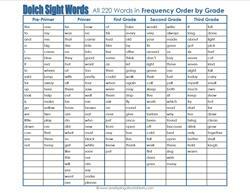 A list of all 220 Dolch sight words with grade levels across the top and the corresponding words listed vertically beneath. This is a list of all 95 Dolch nouns. 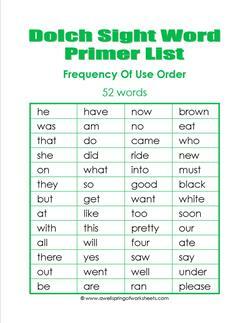 These words were commonly used nouns in the time Edward Dolch did his sight words research in the 1930's, but are still applicable today.